Being a new model, it is going to have newer features that lacked in the previous model. Most manufacturers would take the time to listen to the complaints offered by the customers and improve their product before the next release. Well, that might have worked for this model as it has been made to be better. The manufacturer has included some important new features people would find useful in a protein skimmer. The overall size has now been made to be compact so that you can get it mounted even in tight spaces. Let us get to see more than the manufacturer has introduced to this model. For a model that works great, it has to show that its pump can deliver the right amount of bubbles needed for the process. It is what you get with the Atman 2000 pump installed in this model. The pump has undergone several modifications from the previous models to now have a model that can deliver better performance. The best part is that even with the stronger pump, it is still energy efficient. You will not have to worry about paying for energy bills just because you have a powerful model. The powerful model also means that it gets to clean more water per any instance. It is the reason you would get such a model being used mostly on the 180-gallon type of aquarium. If you have a large aquarium and you want the water filtered adequately, then you can always opt for this model. If you check out several aquarium forums, you would get more reviews showing how the model is effective for handling the large aquariums. 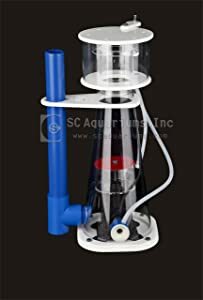 If you were not convinced, then you have to get one to understand the amount of power that the model has to deliver with respect to the filtration capacity. Not every person would have a large space where you can easily install any size of a protein skimmer. It is the reason most would spend hours searching for a model that would fit in their allocated space for a skimmer. That search time has been cut down to a few minutes by opting for this type of protein skimmer. The product is designed to be great in terms of size so that it can work great too. Thanks to the compact nature, you can always find it easily installed in the different sumps so that it can provide adequate filtration easily. It is not just a pump that is going to impress most of the users. Most would also want to understand the amount of noise the model gives out when working. You will be happy to learn that this model comes with a new silencer too. The work of the silencer is to help with keeping the noise level down so that you can even sit in the room with the skimmer and not notice it is in the room too. For many people, such a model can be used in different areas with the aquariums without worrying that it would disturb the peace of the people in the room. When it comes to installation, not all people are always convinced that protein skimmers would be easy to install due to their operational nature. This model comes with laser-cut parts so that you have an easy time knowing which part goes where. Within a couple of minutes, you should have assembled the few parts of the model. You can always end up with the model ready for the installation in the sump in no time. 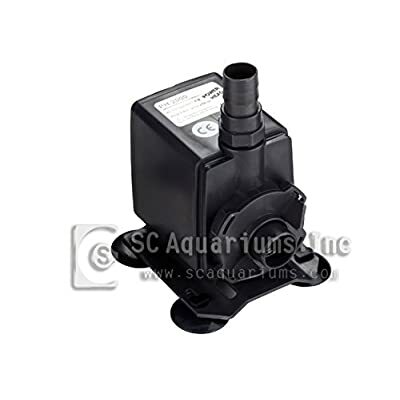 The model can easily be installed into any sump with ease. Make sure to follow the clear instructions as stated by the manufacturer in the manual. At some point, you may have to open the skimmer to clean it so that it can continue working properly. It is here that people would want to know more about the maintenance process. The maintenance process overall is not hard. Just like assembling it, the disassembling process is not that hard. You can follow the reverse of how you assembled it and get it broken down to separate parts so that you can clean it easily. You might want to buy the best skimmer on the market right now. No need to waste time looking for other models when this one is available. The presence of a strong pump is going to make the filtration better and faster. Forget about when you had to use a model that would take forever to work. This one will deliver the right performance for its money.